A pool is so much more than a leisure accessory. It’s the ultimate statement of luxury and prosperity. It draws admiring glances from passers by and provides a talking point for visitors. 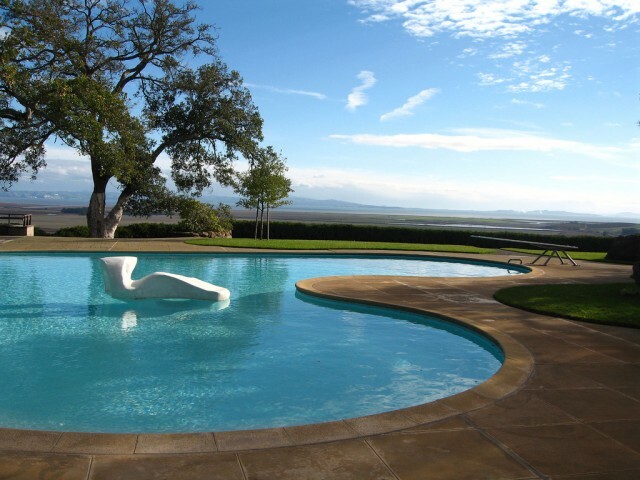 An outdoor pool is among the most luxurious statement pieces that can elevate even the most beautifully composed garden. A pool can add character and dimension to a themed garden or it can provide a dazzling centerpiece around which the rest of your garden is designed. As dramatic a statement as a pool can make, it’s vitally important to remember that it can’t do all the heavy lifting on its own. Even the most opulent pool can be coarsened and made to look cheap if the garden that provides its backdrop is poorly planned or allowed to go to seed. As the winter months turn to spring, many green fingered types turn their thoughts to remodelling their gardens. If you think that the coming of the new year should bring in some changes to your outdoor ensemble this is the perfect opportunity to ensure that the rest of your garden provides a luxurious backdrop to your pool. The leaves have fallen from the trees and littered the ground with their skeletal remains. It’s all part of the magical cycle of nature, but those sodden brown lumps of plant matter can really ruin a well maintained garden in the same way that a scattering of cookie crumbs can cheapen even the most exquisite designer dress. Look into the best cordless leaf blower to send those pesky leaves to a place where they can’t undermine your carefully composed look. You should also take steps to ensure that the leaves don’t encroach upon the look or the function of the pool itself. There are few things more attractive than contrasts. Light and dark, hot and cold, thick and thin; contrasts have been a constant in the realms of design for centuries as they’re able to accent each other by virtue of their difference. With that in mind, what better feature would accompany your luxury pool than an equally luxurious fire pit? There is a gorgeous precedent for architects juxtaposing the garden’s pool with a nearby fire pit. The image of a roaring fire besides a calm and tranquil pool is captivating in its beauty and bring a whole new level of luxury to your garden. Although many prefer the spartan simplicity of stone or ceramic surrounding their pool area to highlight the pool’s opulent beauty, there’s no reason why you shouldn’t make judicious use of plants to add some flourishes of color and texture. In choosing your plants you must select a genus that is hardy enough to thrive in the specific conditions surrounding your pool while providing the splash of color and scent that will elevate rather than detracting from the pool itself. Succulents are a popular choice as they are evergreen and provide the cover to afford you privacy (just make sure that any spines are well pruned), but tall ornamental grasses and even vines can be just the ticket to bring that extra wow factor to your pool.